The General Medical Council has won its appeal against a ruling which gave a seriously-ill patient the right to stop doctors withdrawing food and drink. Leslie Burke, 45, who has a degenerative brain condition, fears artificial nutrition could be stopped against his wishes when he cannot talk. 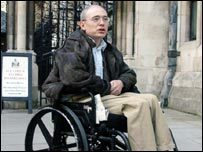 Mr Burke, from Lancaster, had won a landmark ruling, supporting his right to artificial nutrition and hydration. But the GMC appealed, saying doctors could be put in an impossible position. Following the Appeal Court verdict, the GMC said it hoped Mr Burke was now reassured he would receive the treatment he needs, including artificial nutrition and hydration and that nothing in its guidance prevented this. Mr Burke has cerebellar ataxia - an umbrella term for nervous system disorders that cause a lack of co-ordination, but do not affect mental faculties. He knows he will one day lose the power of speech and control of his limbs. Artificial nutrition is classed as a form of treatment by the GMC and therefore last July's ruling, which was hailed as a breakthrough for the rights of terminally-ill patients, raised questions about medical interventions. In the original case, Mr Burke argued the GMC's advice, which gives doctors in cases such as his the ultimate say on what treatment to give a patient in the final stages, was an infringement of his human rights. But during the appeal hearing, Philip Havers, QC, representing the GMC, said the original ruling had fundamentally altered the nature of doctor/patient relationships and was not in the best interests of the patient. He said doctors would have to provide treatment which they knew would be of no benefit or could even be harmful. GMC president Professor Sir Graeme Catto said "Patients should be reassured by this judgement which emphasises the partnership needed to resolve end of life issues." "Our guidance makes it clear that patients should never be discriminated against on the grounds of disability." And he added the GMC had always maintained that no patient would die from starvation and dehydration. Mr Burke said: "Obviously I am disappointed that I have not got all that I wished for. "I have every wish to take it to the House of Lords even though for me personally I should be OK."
He was refused permission to take the case to the Law Lords, but can petition the house for a hearing. Dr Vivienne Nathanson, the British Medical Association's head of ethics and science, which supported the GMC case, said decisions about curtailing treatment were "one of the hardest choices" to make. She said the judgement was a welcome "clarification". But Joyce Robins, co-director of human rights campaign group Patient Concern, which helped argue Mr Burke should have the right to food and water, said the decision was "a huge step backwards for patients". And Liz Sayce, of the Disability Rights Commission, said she was still concerned that the wishes of all patients might not be respected. "The judgement is fine for people who have the capacity to speak. But the difficulty is when you don't have that capacity, it will be back to the doctor taking the decision entirely themselves." Voluntary Euthanasia Society chief executive Deborah Annetts urged the government to step in to create a comprehensive framework for end of life decision-making to create a "better partnership between patients and doctors".